If you have green moss growing in your yard, often referred to as lawn moss, it is a sign of deeper problems in your lawn. Simply removing the moss will not help if you don't correct the problems that allowed the moss to grow. It will quickly grow back. This page will help you understand why it is growing in your lawn and what must be done to fix the problem. Lawn mosses are among the most primitive plants. There are literally thousands of species and can be found on every continent. Most lawn mosses have very specific conditions they can survive in. Conditions range from the blazing hot sands of death valley or even on the frozen tundra. Even in lawns, most will encounter a narrow range of conditions they can actively grow in. This is a good thing for those who do not want the moss. Simply change the conditions sufficiently enough and it will usually weaken the plant. For more stubburn moss problems there are safe and efficient control methods. Lawn Moss is sometimes used by landscapers around stone walkways, etc and can make an attractive addition to your landscape. It will grow in shaded areas where other plants fail. It can be transplanted as long as the growing conditions are favorable for moss. Lawn mosses are part of the division called Bryophyta. They consists of three classes: Bryidae, the “true” mosses, Sphagnidae, are the peat mosses, and Andreaeidae, are the “granite mosses”. Bryidae is the class that lawn moss falls under. However, many plants are called mosses and have similar characteristics, but are not a true moss. For example, Reindeer Moss is actually lichens; Club Mosses and Spanish Moss are actually vascular plants; Water Moss found in ponds, lakes and oceans is actually algae. Mosses tend grow in conditions that do not favor vigorous grass growth. It is most often found where grass is thin or nonexistent. Therefore, the presence of lawn moss is a sign of preexisting lawn or soil problems and is not the cause the problems. Below are a few facts about lawn moss and growing conditions. Lawn moss is generally found in heavily shaded, damp soil areas. It grows low to the ground with a look and feel similar to a carpet. Moss tends to grow in areas where there is little competition from grass. This includes thin grassy areas and grass that is in decline. Moss will grow in sunny locations as long as there is consistent soil moisture from rain or other sources. 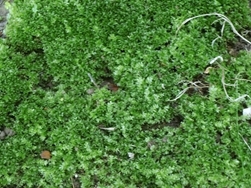 Moss is often found on ground that is low in nutrients. Most well fertilized lawns are a challenge for moss growth because of the competition from grasses. 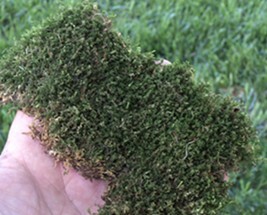 Moss may continue to grow in fertilized lawns if the moss is already present before the fertility program was started. There are exceptions, however. Look below under "Cultural Controls". Lawn moss grows well in poorly drained soil or where there is frequent standing water after rains. Since moss does not have actual roots it grows well in compacted sites. They do form root like structures that pin the moss to the ground. They also grow tiny rhizomes which are horizontal stems that allow the moss to reproduce. Mosses reproduce by rhizomes, spores, and broken pieces of leaves or stems. Mosses produce their own food through photosynthesis, but are not dependent on sunlight for the photosynthetic process like other plants. Removing moss will not solve your moss problems. It will grow back if you don’t fix the problems that allowed moss to grow in the first place. Reduce the Amount of Shade: Moss loves heavy shade and can grow in sites where many grasses cannot. The shady side of houses, large shade trees and trees with low hanging branches and forest conditions are favorite spots. Trimming low tree branches and opening up the canopy will allow more light and air that benefit grasses more than moss. Increase Soil Fertility: Most lawn mosses excel in poor soil conditions, including low nutrient and acidic soils. A soil test should first be performed to see what is lacking in the soil and to what degree. Add palletized agricultural lime to soils with low pH and fertilizer to boost soil nutrients. Adjust Soil Acidity: Adding lime to low pH soils will add alkalinity and raise the pH level. Acidic soils bind certain nutrients making them unavailable to the grass roots and hinder grass growth. It is important to realize that moss does not have true roots and does not draw nutrients from the soil; so correcting the pH is not an immediate cure for moss problems. The purpose of correcting soil acidity is to make the soil more productive for grass growth. Fixing the other problems related to moss growth should follow lime applications. Correct Drainage and Compaction Problems: Compacted soil, high clay content soil, low spots, and grading problems that hold in water and do not allow for proper drainage will encourage lawn moss growth. Add heavy shade to the poorly draining soil problems and the moss favorability rockets upward. Compacted soil can be fixed by core aeration. A core aerator that pulls out plugs of soil can be rented. Inexpensive core aerators that attach to the back of a riding mower can be purchased at lawn and garden stores. Low spots can be fixed by adding quality soil to low areas. It may require planting new grass over heavily patched areas. Grading problems may be harder to fix depending on the size and degree of the problem. For serious problems it is best to consult a qualified landscape professional. Drainage tiles, tractor work, or other things may be needed. The water should be made to drain to a safe area away from the house. Rake It Out: Often times it only takes a steel garden rake to get rid of it. It is a little work, but it comes up easily. Rake it our and reseed or sod after making sure you reduced the shade and other problems. Moss is fairly easy to kill if you use the right chemicals. Below is a list of materials that can kill or injure moss. Copper Sulfate: Can be purchased at garden stores. Apply three tablespoons of copper sulfate to five gallons of water and apply with a sprayer or plastic sprinkling can to moss. Copper sulfate stains badly so use gloves and old shoes and clothes you don’t mind ruining before applying. Iron: Iron is an excellent moss killer. For lawns, iron is usually labeled as iron sulfate, ferrous sulfate, or other types of iron labeling. Iron stains concrete so spray down the concrete with water after applying the product. Follow label instruction for mixing and use. The commercial product called “Moss Out” is an iron/ammonium sulfate product and works well at killing moss. In addition, some fertilizers contain iron (FE) as an additional ingredient. The iron may be too low in some formulations for sufficient control. Fertilizers should be labeled for moss control to ensure it has a sufficient amount. TerraCyte Fungus Control from Natural Environmental Systems is labeled for killing lawn moss. It is environmentally friendly with no bio-accumulation and kills moss by oxidation. The product forms a barrier on the soil to prevent moss from reestablishing. Reapplication may be necessary for lasting effects. Ammonium Sulfate: Ammonium sulfate is a common chemical fertilizer and is a nitrogen/sulfur product. This product can slightly lower your soil’s pH. It can be applied at 10 lbs per thousand square feet and works by burning the moss.Important: When ammonium sulfate is used as a fertilizer it needs to be watered in to keep it from burning the grass. However, since the goal is to burn the moss this product should not be watered in when used on moss. It can also be hand applied (use gloves) so it is only on the moss. It takes knowledge of grass species and growth habits if you broadcast this product over your lawn in an attempt to kill moss. Do not use this product in the summer on cool season grasses. Applied at the wrong time of year on the wrong type of grass and you can seriously injure your grass as well. Note: "Gylphosate", the active ingredient of "Round-Up" and similar vegetation killers will have little to no effect on moss in the lawn. However, it will kill the grass surrounding the moss should the chemical come in contact with it. All plants have a preferred soil pH. Understanding soil pH and the different materials for making corrections is not hard if you know what to do. Everything you need to know is here. Why is fertilizer important? This page answers that question and describes the basics of grass decline when left unfertilized. It offers alternative steps for maintaining a healthy lawn. Tree roots can be a problem in lawns. Some roots grow near the surface, add to soil compaction, and make mowing difficult. Learn what can be done with roots and how to protect your trees from damage. Pet are wonderful, but dog urine can damage lawns. Find helpful tips and techniques to solving these problems without giving away your pet. Organic compost top dressing is a fairly new practice for home lawns. Get helpful advice and step by step directions for the best possible results.